I'm taking a break from pulling my hair out and gnashing my teeth writing, to show you my new sacred space. I so much enjoy my cozy spot on the deck in the summer and was desperately wishing I had a similar spot for the winter. 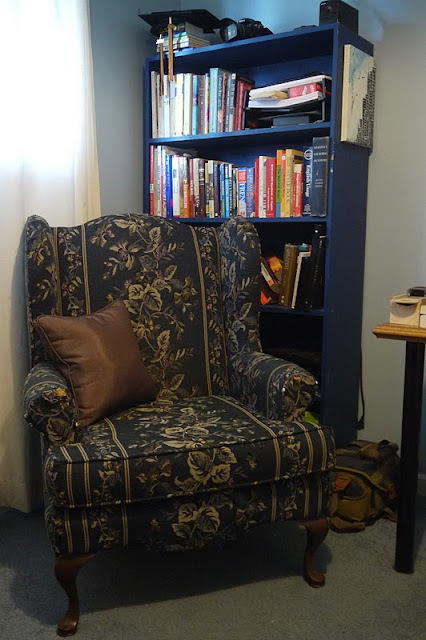 After I finally got around to boxing up the mess tidying the office, and my daughter moved in with nicer living room furniture than ours, a lovely sacred corner has magically appeared. I'm looking forward to sending away my next missive for critique and rewarding myself with some time in the wingback with a cup of Market Spice tea and Abrahm Verghese's Cutting for Stone. Now that's some inspirational writing!